Beginning in May 2013, VA loaned iPads loaded with a suite of nine apps to almost 900 Caregivers of seriously injured post-9/11 Veterans. The apps provided Caregivers and their Veterans with secure access to VA health data, the ability to track personal health-related information, and new ways to share information with VA care teams. The Family Caregiver Pilot ended in the fall of 2014, and provided VA with valuable insight into the health care needs and priorities of Veterans and their Caregivers. Results of the pilot highlighted the importance Veterans place on access to their health records and their VA care teams. VA is now evaluating and refining the apps based on user feedback, and VA apps connecting to VA’s Electronic Health Record (EHR) have been prioritized for development and nationwide launch. If you are a Family Caregiver Pilot participant and you have a question about the pilot or a particular app, visit the Family Caregiver Pilot Help Center or call the Help Desk at (877) 470 5947, weekdays between 7 a.m.-7 p.m. (CT). Thank you for assistance in helping us ensure VA mobile apps are useful and valuable tools for Veterans across the country. Care4Caregiver: The Care4Caregiver App is a self-assessment tool that helped Caregivers keep track of their level of strain overtime, provided stress coping tips and connected Caregivers to available community and personal resources. Health Advocate: The Health Advocate App allowed Caregivers to view health information and enter data on behalf of their Veteran, as well as to cut and paste, take screen shots and save information. Health Assessment: The Health Assessment App enabled Veterans to provide focused data about the impact of selected items on various aspects of health, disease and management. Journal: The Journal App is a personal health journal that allowed Veterans and their Caregivers to enter, view, and track vital signs and patient generated data that could be shared with their VA care team. Notifications and Reminders: The Notifications and Reminders App allowed Veterans to receive messages, instructions, encouragements and educational information from their VA care team. VA PTSD Coach: The PTSD Coach App helped Veterans and their Caregivers learn about and manage symptoms that commonly occur after trauma and share symptoms with their VA care teams. Rx-Refill: The Rx Refill App provided Veterans and Caregivers with the ability to request and track medication refills from their mobile device. The app showed which prescriptions are eligible for refill and allowed users to submit refill requests to the VA Mail Order Pharmacy. Secure Messaging: The Secure Messaging App gave Veterans another tool to connect and address non-urgent issues with his or her VA care team beyond the traditional office visit. 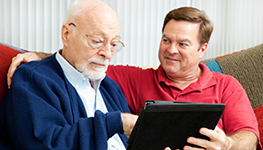 Summary of Care: The Summary of Care App allowed Veterans and their Caregivers to receive and view VA medical information – including lab results, medications, allergies, information on past and upcoming appointments, progress notes from clinic visits, hospital discharge notes, radiology exams and more. For more information about upcoming VA Mobile Health opportunities, visit About VA Mobile Field Tests.